Akari asks Takeru questions about the other Kamen Rider which he doesn’t have any answers to. And Grandpa Sennin is not around either. A frustrated Takeru escapes Akari’s curiosity and heads outside to be alone. 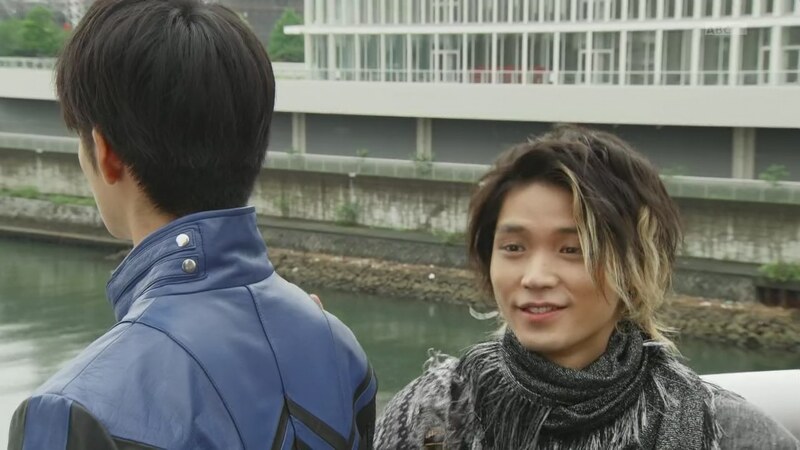 Meanwhile across town, the Mysterious Man asks Aran about him being of no help in collecting the Eyecons as he promised. Aran says not to worry. He won’t forget his promise as long as the Mysterious Man does not forget his. The Mysterious Man says Of course and leaves to make preparations. 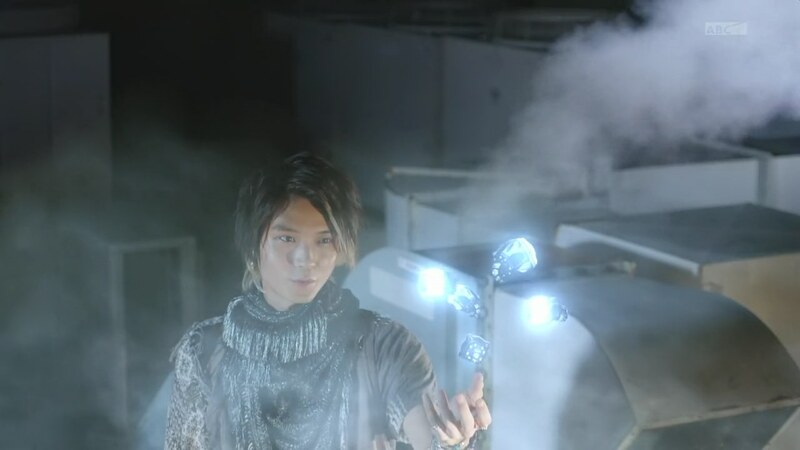 But Aran begins his own plan and sends a couple of Ganma Eyecons out to infect the planners of a new city hall project. Next morning, the black and blue jacketed-person stands in the temple courtyard. Takeru sees him, but just politely nods. The guy leaves. Anyway, a little boy named Kanta has a job for the SPI. He explains that his previous school merged with another and was closed down to make way for a new city hall. The children’s parents, including his mom, protested the decision but were attacked by an unseen thing. This is definitely a job for Takeru, but he’s more concerned with finding out more about the other Kamen Rider. Onari tries to convince him to do this first. 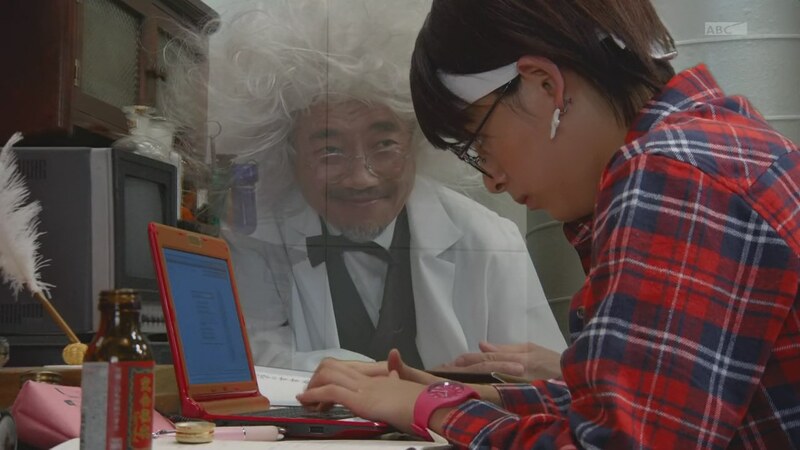 Down in the lab, Akari is continuing her “science explains everything” work while Grandpa Sennin watches, amused. Akari maybe senses him in the room and asks him about the other Rider. He decides to leave. Kanta brings Takeru and Onari to the old school where his mom and other parents are picketing. But they are suddenly attacked. Kanta runs over to his mother and Onari runs after him. Takeru sees the Ganma in a car nearby. He runs over and henshins. To fight off the Ganma’s bullets, Takeru goes Newton. That drives the Ganma away. Takeru calls Yurusen who arrives with the Ghostriker and he hops on to pursue. But the other Rider appears and gets in his way. 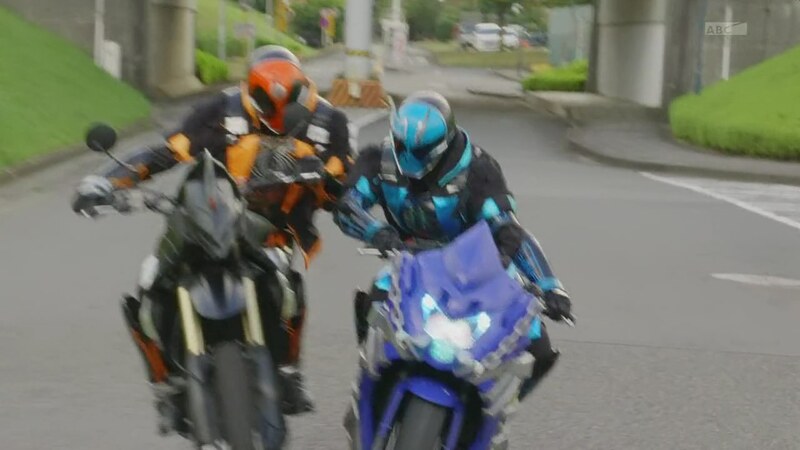 Takeru follows him, but the blue Rider knocks him off the bike. Takeru demands he return the Nobunaga Eyecon and to reveal himself. But the blue Rider just proceeds to knocks Takeru around and calls him weak. Takeru goes Edison and the blue Rider goes Nobunaga. The guy says he doesn’t borrow the powers from the luminaries, he controls them and uses them as his own. Takeru does not understand their value which is why he can barely use the power. Takeru says he believes in himself and attempts an Omega Drive, but the blue guys unleashes an Omega Spark to counter and Takeru gets thrown and dehenshins. The guy takes the Edison Eyecon. Takeru tries to get himself up, saying he will not give up. The guy dehenshins… and it’s the creeper from the temple earlier! The guy questions Takeru’s resolve and asks if he’s willing to give up his own life to protect others. Takeru hesitates to answer. The guys says Takeru is weak and soft. And one day, he will need to choose. The guy leaves and runs into Aran with whom he’s apparently friends with. Or at least acquaintances. Aran thanks him, Makoto, for saving his Ganma. Makoto asks how long Aran will continue using the Ganma. Aran is just amused by his bluntness and says he would love it if his “best friend” helped him. Makoto says he can’t right now. “Luminary Eyecons, are they really that important?” Aran asks. 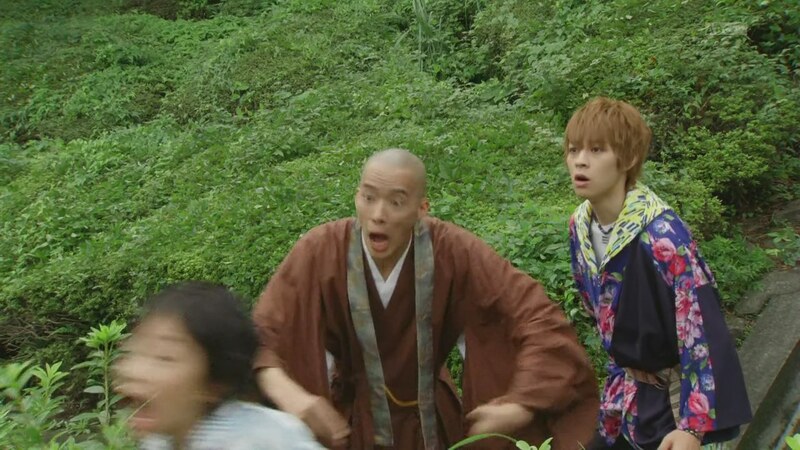 Akari and Onari find Takeru and run over to him. He tells them about the Edison Eyecon and the other Rider. As Kanta watches, Takeru asks them if he really is naive and that’s why he lost. Onari says he can be indecisive at times, but both he and Akari tell Takeru that he just has to believe in himself. Kanta runs off and Takeru sullenly walks away as well. He heads to the shuttered school, thinking about Makoto’s words. Takeru wants to live again, but he also wants to protect people. Takeru runs into the school and hears the five Ganma-controlled officials talking about their plans. Yurusen flies in and tells Takeru to force the Ganma Eyecons out of the controlled people by drawing the Eye symbol. Takeru henshins and does just that. The basic Ganma pop out of the men and Takeru proceeds to fight them. He manages to kill three, but two of them escape the classroom. Akari and Onari arrive just as the main Book Ganma reappears to fight Takeru. Akari shoots at them to make them visible. Book Ganma shoots at Takeru who attempts to go Newton, but the two basic Ganmas have both Akari and Onari captured. Book Ganma shoots the Newton Eyecon out of Takeru’s hands and warns him not to go near it or his friends are dead. Book Ganma shoots at Takeru who can’t decide between the Eyecon or his friends. 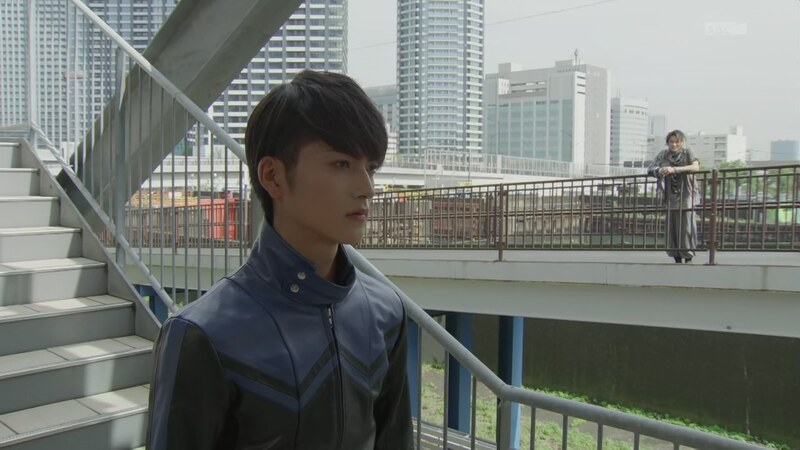 Just then, Makoto arrives and henshins in front of Takeru for the first time as Kamen Rider Specter. Book Ganma tries to get Makoto out of the way, but he doesn’t. That makes Book Ganma shoot at Makoto instead and he decides to uphenshin to Tutankhamun to fight back. Makoto takes care of the two remaining basic Ganma and then turns his attention to Book Ganma. 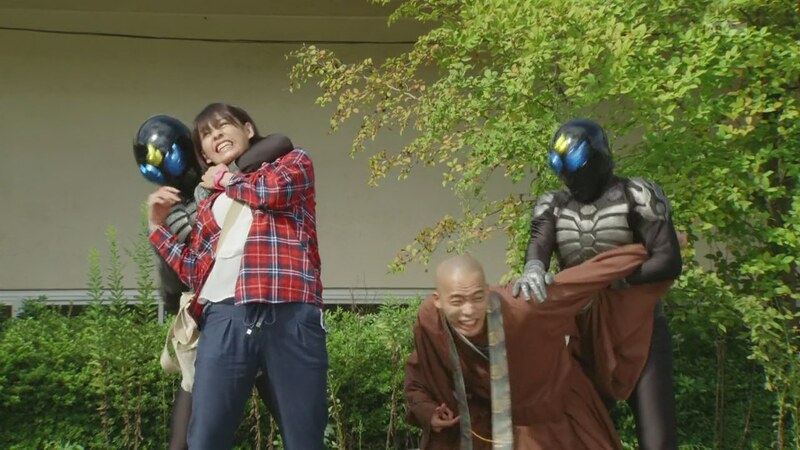 Takeru, Onari and Akari just watch as Makoto Specter easily takes care of the Ganma. 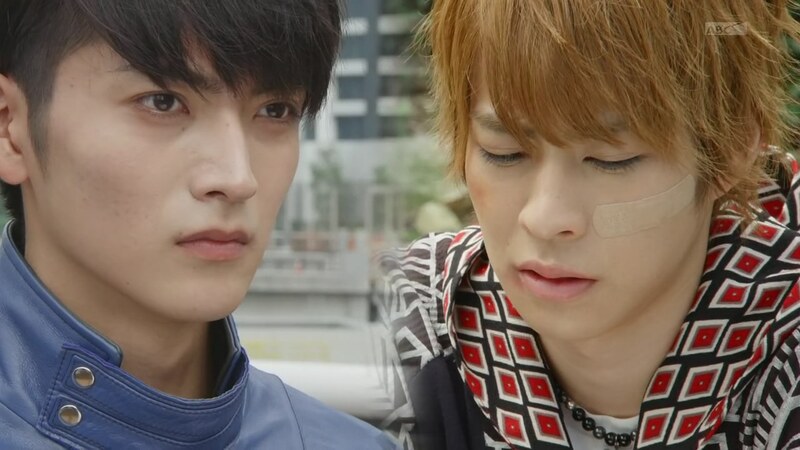 Makoto picks up the Newton Eyecon and reminds Takeru how weak and naive he is. Both Takeru and Makoto initiate Omega Drive kicks. 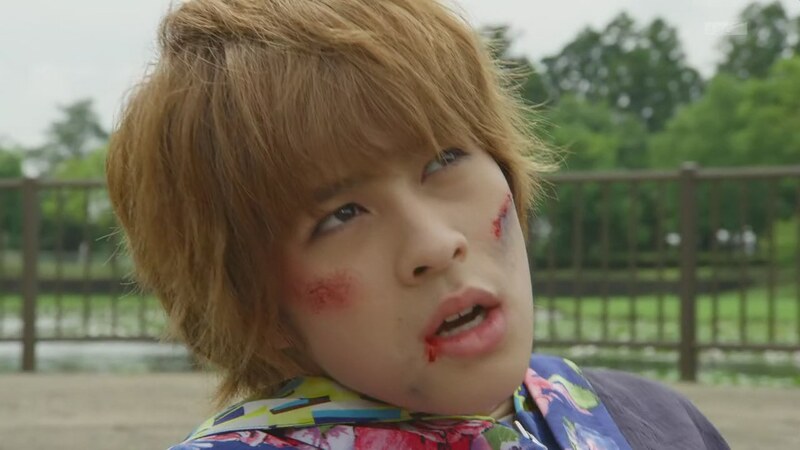 They hit each other, but Takeru dehenshins. 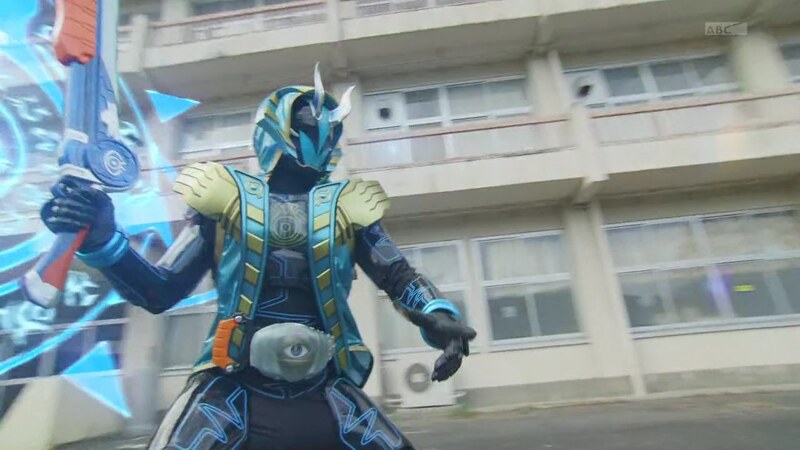 Even so, he has been able to take back the Edison Eyecon. Makoto tries to approach Takeru to finish him off, but Akari begs for him to stop. Onari screams fire so the authorities can arrive quickly. That signals Makoto needs to go right now and he does. Takeru gets up and leaves. On a bridge, Aran again approaches Makoto. He says even if the Ganma were defeated, their preparations were finished anyway. A giant eye is on top of the school. Onari tells Kanta his mom’s protest was successful and Kanta thanks them for their hospitality. Especially one man who told him about Daitenku Temple. Onari and Akari aren’t sure which man could this be. When Kanta leaves, they wonder where Takeru might be. Takeru is actually visiting his father’s grave. He asks for his guidance. Makoto is in deep thought as well. An overall solid episode. I think the case of the week was kinda bland. Not too interesting and really didn’t do much as a way to make a point about Takeru or another character. Still, I think Takeru’s self-doubt is an interesting aspect of the story to look at. The theme is to believe in yourself. Takeru was thrust into this power without him being at all prepared. So it can be understandable that he is struggling with what to do. He’s definitely under a lot of pressure with the Eyecons, being dead, helping with cases each week, etc. Plus, he’s still a kid. Just turned 18 right? It’s definitely refreshing to have a younger Rider this year, but one that is still serious and focuses on the job at hand. Or two. Definitely hoping we learn more about Aran soon, especially since they touched on him being “best friends” with Makoto. There were definitely nice teases about what’s going on with Aran, Makoto and even the Mysterious Man. So I hope they follow through in the next couple of weeks and really dive into the villains’ stories more. Everything else was fine. This episode did its job and added the few wrinkles necessary to show that there are definitely obstacles Takeru will need to overcome instead of him just conveniently able to find Eyecons each week. 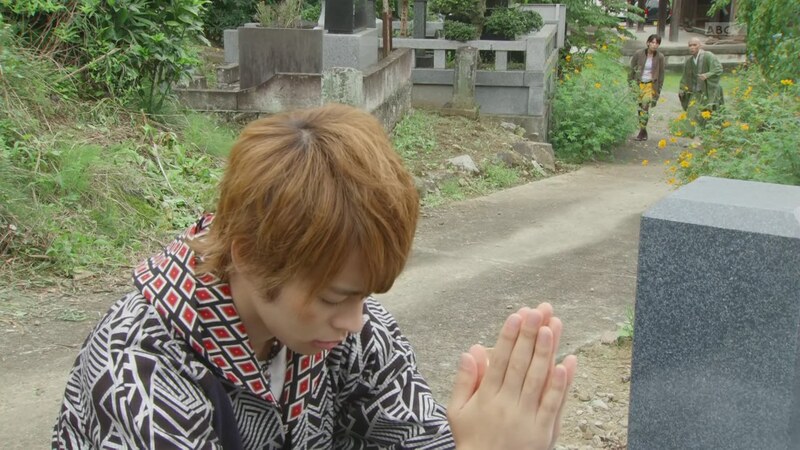 I also really liked the last scene with Takeru at his father’s grave. A very nice touch. ← Recap: The Amazing Race 27, Episode 8 – "He always loves something he can manhandle." Makoto’s character seems to be going for the Kaito route, with the difference between his and Takeru’s emerging philosophies. And man, Nobunaga’s power is rather awesome, and I like that little track that played in the bike chase. Aran is also shaping up to be an intriguing character, hope they don’t prolong the mystery too much. Overall, another solid episode.